Adjust the feet pad so that it meets comfortably with the rear ankle grooves. Sit with your lower back all the way against the back pad. There may be handles available that you may grasp to keep your body from sliding. If there aren't handles, then grasping the seat pad may also work. Bend at the knees, curling the weight toward your rear thighs, while exhaling throughout the movement. (Pointing the toes puts focus on the hamstrings, while flexing the feet puts focus on the calves). It is feasible to do these one leg at a time, if desired. Slowly allow the weight to raise your lower legs to the starting position, while inhaling throughout the movement. Leg curls can be performed one leg at a time, or even alternating legs, if desired. Pointing the toes (a.k.a. plantar flexion) puts more focus on the hamstrings. Flexing the feet (a.k.a. dorsiflexion) puts more focus on the calves. Both muscle groups will be worked either way, but the focus will change depending on foot position. 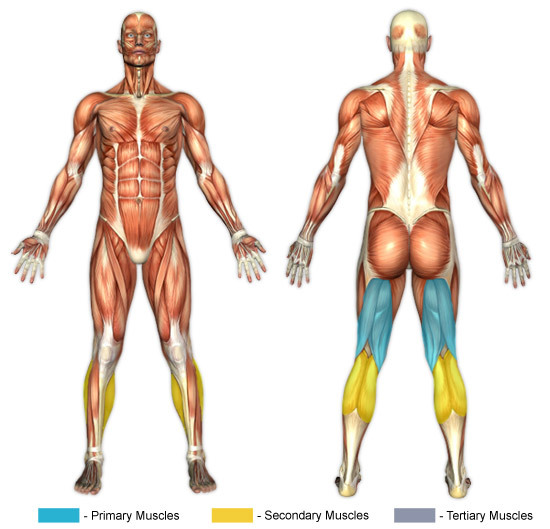 The seated position of this variation (which has the pelvis tilted forward) will especially stretch your hamstrings and thus provide a particularly intense focus on the entire hamstring muscle group, to include the long head of the biceps femoris (the outer-lying, outer muscle of the back of the upper leg), semintendinosus (the outer-lying, inner muscle of the back of the upper leg), and semimembranosus (the underlying, inner muscle of the back of the upper leg).